disinvestment secretary and 1980 batch IAS UP cadre IAS Aradhana Johri. The defaulters’ list includes two officers belonging to 1979 batch, six from 1980 batch, four from 1981 batch and three from 1982 batch. In fact, the batches of 1982 and above are quite senior, as they qualify to hold the rank of secretaries once they are empanelled. 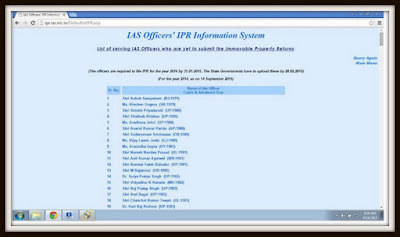 Among the highest defaulters batch-wise, as many as 29 officers of 2005 IAS batch have failed to submit their returns as on today, whereas 28 officers each of 2012 and 2013 batches are in the list of defaulters. Meanwhile, The Times of India quoting an analysis of a website called “Factly.in” reports that “15% IAS officers claim to own no land, house”. The analysis is based on the immovable property returns of 3,800 IAS officers who have been filing their returns since 2010. According to reports, 57 IAS officers of UP cadre have no properties whereas 42 from Madhya Pradesh cadre and 33 from Maharashtra have claimed to have no properties in their name. The newspaper also quoted a former IAS officer and ex-Chief Information Commissioner Wajahat Habibullah who said, the report of 15% IAS officers’ not having any property does not sound“credible”. BoI has not analyzed the raw data, but there is a possibility that young officers belonging recent batches may not have any property at all. For example, will anyone be surprised if an IAS officer of 2013 or 2014 batch claims that he or she has not bought any flat or land? Quite credible. 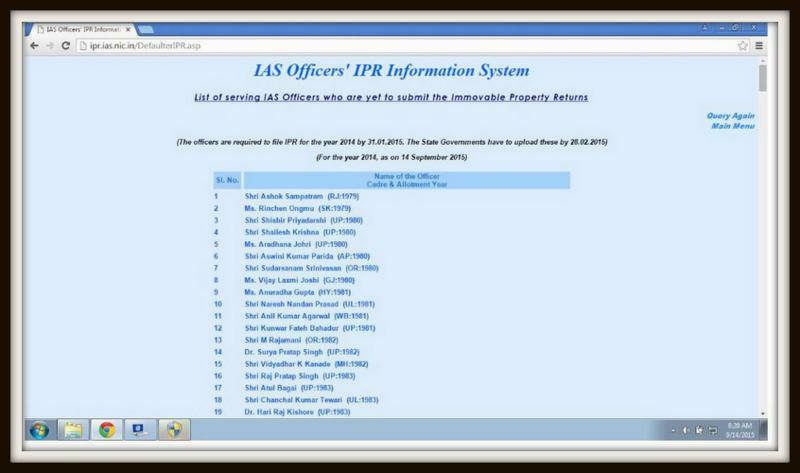 Also, if both the spouses are IAS, it’s possible that properties is in the name of one. In fact, the bigger concern is the existence of benami properties which officers buy in the name of their distant relatives to park their ill-gotten money.